Had the BEST time at the Red Sox game against Texas on Wed. night. It was my 1st game this season! I LOVED the seats. They were close to home plate & were awesome. We were really close to the field in box seats! Red Sox won with a walk off run from Youk in the 12th innning! Grandslam by Drew, Varitek @ the plate & Papelbon on the mound in the 12th! McDonald was awesome! Now we need to get Ellsbury off the DL. If we still had Schilling & Bay we’d be looking real good! And for all of you who were on Tek’s case last fall! Check out his batting average now! Red Sox Exhibition Game against Boston College started at 6:05! First spring training game in 1 day 1 hour and 39 minutes. Can’t wait to see Jonathan Papelbon , Jacoby Ellsbury, Kevin Edmund Youkilis, David Ortiz, Clay Buchholz, Dustin Pedroia, Jason Varitek & all the Red Sox back on the field! Well tomorrow is the big day! 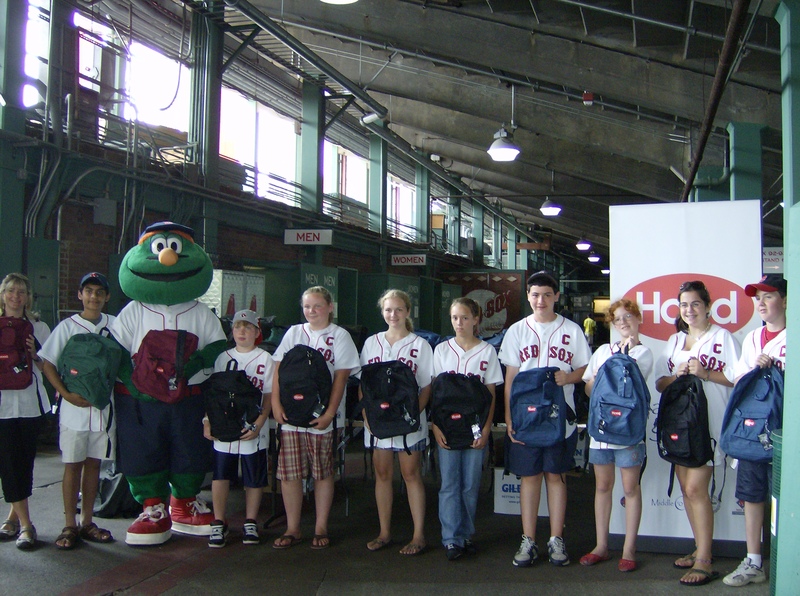 The Red Sox Kid Nation Captains will be at Fenway filling and giving out 3,000 backpacks to kids going into 5th grade in Boston. Hood donated the backpacks & the captains have worked very hard to collect supplies to fill them so we can help out other kids. this is what I have managed to get donated & will be taking to Fenway tomorrow!t 1st a shout out to some special people for their help! Amy Conley & staff of Financial Engines. Andrew Weidner, Mary & Joseph Cashman, Kevin Kennedy & Family, Kevin Donaher & Family, William DiMento, Hillary Burr & staff at Wolf & Company, North Shore Young Democrats, Brendan Crighton, Sen. Tom McGee & his staff, Finagle a Bagel, Newbury Comics, Victoria Enos & employees of Sun Life Financial,LynnCam TV, Dave Riley Jr, Dave Solimine, Patty Theriault-Lopes & The Daily Item. Hood & the Red Sox are awesome for letting us do this project. Mardi Fuller & Joe Chamas in the Red Sox Office were awesome too! Thanks guys! In Papi I Trust & Pitching Troubles! I hope everyone is watching Big Papi’s Press Conference! I KNEW BIG PAPI NEVER USED STEROIDS! There were 104 people on the list & only 83 positive test results & some of the the tests could have been from the same players. I hope all you sports writers that talked smack about Ortiz apologize & then keep your mouths shut until you know the FACTS! Sox/Yankees games usually are long but 15 Innings is a little crazy especially when it’s still 0-0 going to into the 15th! Can we clone Beckett & maybe we should bring back Schilling. Can[‘t we pay someone to take Dice K off our hands? I won 2nd place in the http://www.iwontcheat.com/ essay contest about what I would say 2 my favorite athlete if they were caught using illegal drugs. Now people are saying Big Papi took something illegal! I hope he didn’t do anything wrong on purpose. Maybe he just drank an energy drink or something that had something bad in it & he didn’t know it. I would be so upset if Papi cheated, I would rather lose than win by cheating. But I don’t like all the newspaper reporters writing mean columns about Papi because we don’t know what happened yet! I think he was brave to go out & play last night after the news came out about the drug tests & I respect him for that! Until someone proves he took steroids & knew he was taking them I still believe in Big Papi! I believe he will tell the team & his fans the truth about what happened! AWESOME!!! Beckett’s 100th win. He pitched the whole game & shut out KC! Nuff Said! This was a great series! Papi, Bay, Tek ! Go Boys! And people please LOSE the pink hats! Pink is my favorite color but it’s the Boston RED Sox! Even when I was four years old I wouldn’t wear pink Red Sox gear even though everything else I owned was pink. Do you have any idea how silly you look? When I see fans wearing pink hats or t-shirts with little white letters- I can’t even tell who you’re rooting for. Show your team pride & wear TEAM COLORS! What do you think the players think when they look at in the stands and see a sea of pink? This whole pink hat/shirt thing is so embarrassing!